Cut open 500g of free-range chicken breast. Tear apart 200g of homemade mozzarella cheese. Ouch. Add 2 tbsp. of homemade ketchup into the bowl. Add 1 tbsp. of homemade rose hip jam to the ketchup. Mix well. Slice & chop 1 extremely hot Serbian chili. Add it into the bowl. Smash 2 garlic cloves. Peel it then slice & chop and add to the sauce. WARNING! THIS SAUCE IS EXTREMELY HOT! Slice 1 zucchini onto circles. Add 1/4 cup of olive oil to the vinegar. Add 1/4 cup of light soy sauce into the bowl. Chop handful of fresh dill. Add it to the sauce and mix well! Preheat the grill. Do not forget to cover it with oil to prevent veggies and breasts from sticking to it. Grill chicken wrapped chicken breasts for 12 min. Flip halfway. Grill veggies for 2 min. on each side. After grilling toss zucchini circles into the sauce. Mix well. Let it marinate for a while. Cut the somun bread in half. Warm it on the grill. Place bottom half of somun bread on the cutting board. Cover it with extremely hot sauce. You remember the warning, right? Few lettuce on the sauce. Add wrapped chicken breast above. If you want you can make it double or triple just add few chicken breasts. Add the filling with sauce. Final touch – cover with top half of somun bread. 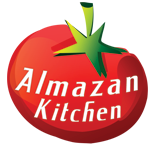 Our special AlmazanKitchen chicken burger is ready!